Epicurus did not write poetry. Indeed, like Plato, he was suspicious of poetry and the forms of education which inculcate the desire for poetry. He held that the poetic stories are responsible for spreading all kinds of false beliefs about the world. His primary concern was with the religious doctrines which use poetic and musical mediums to spread a fear of vindictive Gods and gain followers. Epicurus was trying to counter such religious doctrines with his own philosophy. The irony is that the tenets of Epicurean philosophy have reached the modern world after traversing more than two millennia through the philosophical poem De Rerum Natura, attributed to Lucretius, the Roman poet and philosopher, who was a devoted follower of Epicurus. But why did Lucretius decide to write in poetry? 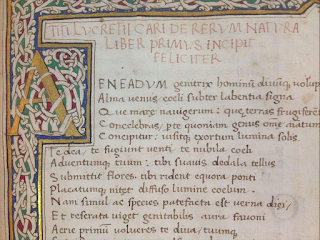 Lucretius, a devout follower of Epicurus, writes an epic poem. And the choice to write poetically is itself a subject of the poem. From the very opening lines, Lucretius encourages us to think about the choice and about the desires aroused by poetic writing-at the very same time that we are also asked to think about the character of desire in nature as a whole. For after calling on Venus as the principle of sexual desire in all of nature, the principle that explains animal fertility, he invokes her as the ally of his poetry, the one who can give a pleasing character to his words. And later in the first book he explains to us why this pleasing character is so important. With strong mind [mente] I travel through the pathless haunts of the Pierides, places never trodden by any before. It is a joy to approach these fresh springs and drink, it is a joy to pluck new flowers and to seek a distinguished crown for my head from that place whence before this the muses have never wreathed any man's temples-first because I teach about great things and hasten to free the mind from the tight bonds of religion; then, because on this dark subject I put forth verses so full of light, touching everything with the muses' charm. For this too is seen to be not without a reasoned plan [ratione]. But as doctors, when they try to give bitter wormwood to children, first touch the rim all around the cup with honey's tawny sweet liquid, so that the children's unforeseeing youth might be tricked as far as the lips, and they meanwhile may drink the bitter drink of wormwood down, and, though taken in, should not be held fast, but should instead be restored in this way and become healthy-just so I now, since this reasoned argument [ratio] often seems forbidding to those who have not tried it, and the many shrink away from it, have decided to explain our reasoning [rationem] to you in a sweetly speaking poetic song, and, so to speak, to touch it with the sweet honey of the muses, to see if perchance by this reasoned plan [ratione] I could hold your mind on our verses, while you survey the whole nature of things, its structure and form. 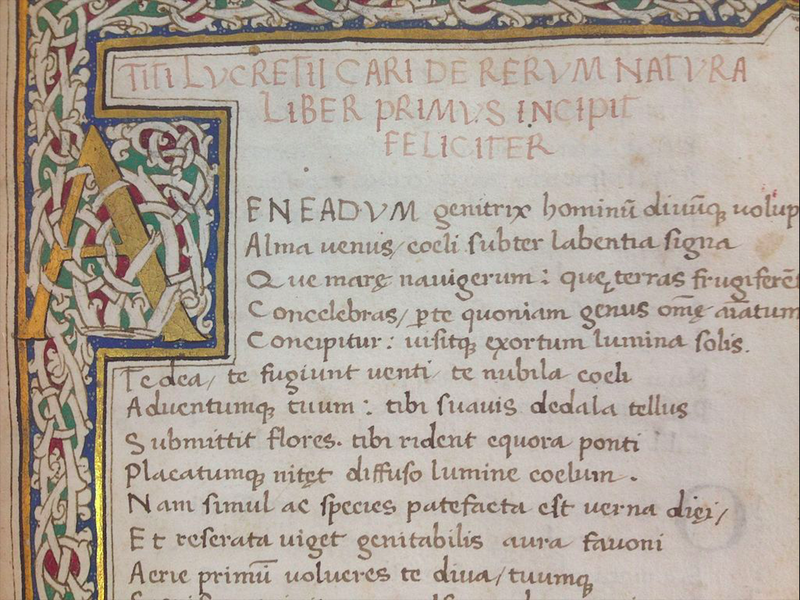 Lucretius depicts himself as an innovator in that he is writing Epicurean poetry. This is innovation both from the point of view of Epicureanism and from the point of view of poetry, which has not treated these important subjects except in the way of traditional anthropomorphic religion. He tells us that his "reasoned plan" for using poetic language was inspired by practical and medical motives. In order to engage the reader in a process of therapy leading to health, he will provide the inner argument of the poem, its ratio, with a pleasing sweet surface. The "reasoned plan" (ratio) of his poem is this combination of argument with poetic surface. The truths of Epicureanism are difficult and, from the perspective of the pupil, unap­petizing, in that they will require him to detach himself from much that he deeply values. Therefore this healthful medicine needs a "coating"; and by describing poetry as providing a coating or surface, Lucretius implies that the argument itself will not be corrupted by its commerce with poetry.